By default, you can use 112 dots max to define a face. More dots you use, better morphing quality will be, but you have to spend more time to adjust each dot when needed. Now you can customize the face model by using all or just a part of the 112 standard dots. For example, you may don't need to use the dots of ears and forehead, or you may simplify the structure of eyebrows, eyes, mouth, etc. 1. 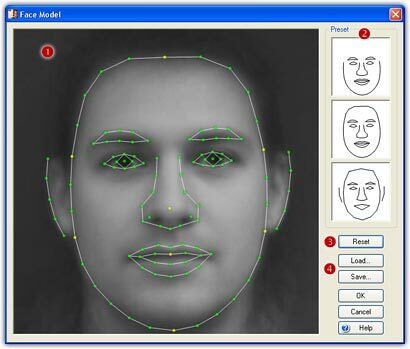 To customize the face model, click the Face Model button on the Face Locator and the window below will appear. 2. You can simply choose a face model from the Preset list ( ), and the face model will be showed in the Edit Area ( ). 3. You can edit dots and lines of the face model. Note, only the dots will be concerned with the morphing process, but the lines will help you recognize the face structure. Dot: Right click a dot to make it used/unused. Hold the CTRL key and click a dot to make it highlighted/normal. Highlighted dots can help you recognize important features positions. Line: Right click on a line to delete it. Click a dot and then click the other one to create a line between the two dots. 4. Whenever you want to restore to the default 112 dots model, just click the Reset button ( ). 5. You can save your own face model to a .fmo file and load it later by clicking the Load/Save button ( ). Note, the program will automatically load the customized face model when it restarts next time.